(By Imtiaz Ullah) Malaysia is an amalgamation of various cultures and is the perfect mix of Malay, Chinese, Indian, Thai, Javanese, and Sumatran culture. People are ever welcoming of the tourists and travellers from different parts of the globe. Our journey from India to Kuala Lumpur, the capital city of Malaysia starts with our cab being late. We reached airport just on time. The beautiful Malaysian sunrise welcomes us to the capital city. We checked into our hotel- Furama in KL, Bukit Bintang on day 1 morning. It is an hour long drive from KL (Kuala Lumpur) airport. The Sepang F1 circuit is in close proximity to the airport. We were delighted when we saw the spacious rooms reserved for us with sufficient sunlight and a wonderful view of the Bukit Bintang road. We decided to rest for the first day and prepare for the long journey ahead. My wife was eagerly waiting to have a glimpse of the shopping extravaganza in Kuala Lumpur and to engage in some shopping. In the evening, we ventured out into the famous Berjaya Times Square of KL. It is a huge shopping complex housing some of the world’s best known clothing brands and eating joints. If you are a cheese lover, please drop by at the bakeries and have cheese tarts coupled with other delicacies that appeal to your taste buds. This is how we spent our first day in KL. The next morning, we had breakfast at the cafe of Hotel Furama. It was an excellent breakfast with a plethora of choices. Cost of breakfast for two was 50 RM (Malaysian ringgit). We checked out from Furama Hotel at 11:30 in the morning. Our second destination is Penang (George Town) – the place where different cultures meet. We took a taxi from the hotel to the bus terminal. We reached the bus terminal and purchased our tickets to Penang. We reached Penang bus-stop by 7 PM. From there, we took a taxi to Georgetown which cost us about 30 RM. We then checked-in at the Reunion Heritage Hotel at 107 Victoria Street. It’s a heritage property, a small hotel but full of antiques. Tim Prabhakar, the partner of the hotel is very helpful and a wonderful person. Must try: Nasi Lemak- A Malay fragrant rice-dish cooked in coconut milk and pandan leaf. It is the national dish of Malaysia. Nasi Goreng- literally meaning “fried rice” in Indonesian and Malay. It is a meal including stir fried rice in a small amount of cooking oil or margarine, typically spiced with kecap manis (sweet soy sauce), shallot, garlic, ground shrimp paste, tamarind and chilli and accompanied by other ingredients, particularly egg, chicken and prawns. The historic city of Georgetown covers an area of 10,938 hectares bound by the Straits of Malacca on the North Eastern Cape of Penang Island, Lorong Love to the North West and Gat Lebuh Melayu to the South West corner. Exploring the Georgetown steel rod structures and art walls are like treasure hunting in an enchanted part of the world. With the maps in hand, we ventured out to explore the steel rod structures and hunt art walls. To our delight we found many, if not all. 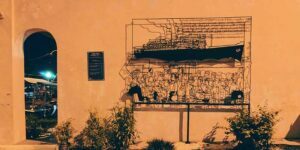 Each steel rod structure and art work had a story to tell. As it was a hot day, we finally settled for a cab ride around the city and visited the Blue Mansion and the famous Chocolate Factory. My excitement know no bounds when I stepped into the Chocolate factory, they had some of the best chocolates I had ever tasted. I couldn’t resist myself from quickly buying a handful of chocolates immediately. In the evening, we ventured out to Penang Hill. We booked an Uber till the tram station. The tram took us to the top of the hill. The hill presents a breathtaking view of the entire Georgetown City with lights glittering all over. It is mesmerizing to say the least and must not be missed at any cost. After spending two quality hours at the top, we boarded the tram and headed back to the station. From the station, we hired a taxi to Little India and had dinner there (naan, biryani and chicken/ mutton roast). If you are in Georgetown and a foodie like me, “Little India” road is highly recommended. This place is a gastronomic delight for your taste buds and one can feel the aroma of food in the air emanating from the eating joints in the alleys. After a sumptuous dinner, we walked back to the hotel. Meanwhile it started drizzling and we were drenched in the cool rain. After a memorable day at Penang, we finally reached our hotel. Langkawi, an archipelago of 99 islands about 30 km off the coast of northwestern Malaysia is also known as the “Jewel of Kedah”. Langkawi is all about nature. If trees, beaches, and sunsets are your thing, then you may wind up while visiting this paradise and wish to never leave. Our next destination was Pulau Langkawi. We did not pre-book ferry from Penang-Langkawi. When we called ferry office, to our utter disbelief there were no tickets available. We were at a complete loss. Tim Prabhakar, a partner of the Heritage House was very cool and supportive in this regard. He advised us to take an Uber to Kuala Perlis and from there a ferry to Pulau Langkawi. Thanks to him, our stay was memorable due to his impeccable hospitality. I promised to stay in touch with him. The cab took about 3 hours to reach Kuala Perlis and cost us 125 RM. From the counter, we booked two tickets for 36 RM to Pulau Langkawi. The ferry dock was very clean including the toilets, the ferry itself was big and spacious. 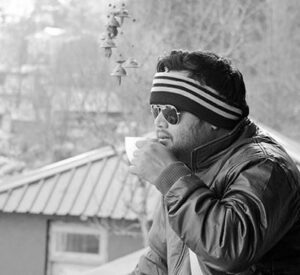 While I was penning down my thoughts, my wife Priyanka was busy taking pictures. Finally, we reached Langkawi. From Langkawi wharf, we took a taxi to the Sunset Beach Resort at Pentai Cenang. It took us 30 minutes to reach the resort. Once we checked-in to the Sunset Resort, we were allotted a room and after freshening up, we ventured into the Pentai Cenang Beach. In Pentai Cenang, there are many food joints from different countries. Trying the different varieties of food available is an absolute must in Cenang. The sun was setting and we managed to capture some beautiful pictures of the mesmerizing sunset. People were engrossed in various water sports like jet-skiing, parasailing, etc. We being exhausted with all the travelling, gave the water sports a skip and instead engaged in some relaxed strolling on the beach. Soon taken over by hunger, we started hunting for food joints. In Pentai Cenang, there are many food joints from different countries. Trying the different varieties of food available is an absolute must in Cenang. We had a pizza and juice for 36 RM and strolled through the streets which was hustling and bustling with people from different nationalities. It’s a perfect place to chill and for someone like me, a die-hard foodie. There were so many delicacies to try that I felt like a little boy in a chocolate shop.After walking a lot, we decided to relax and pamper ourselves with a foot massage. It costed us 49 RM each. The massage was indeed relaxing and all the pain in my feet was released and I felt relieved. I tried a similar massage in Thailand as well. The massage in Malaysia equally matches that of Thailand, if not better. The next morning, we got up early and had our breakfast. The mini bus arrived and picked us from our hotel. We reached the jetty from where our activities were lined up for the day. Our guide briefed us about the trip and the dos and don’ts. The mangrove tour started from the Bat Cave. The cave housed living fossils and as we walked through, we could see tonnes of bats hanging from the roof and walls. This was a sight which I hadn’t witnessed before and began excitedly clicking photos. As we moved ahead, we witnessed fossils of different shapes and sizes, wild monkeys and weird looking spiders. I was particularly surprised to see some trees growing downward. When I asked the guide, he told me that these are peculiar trees called bhogi in local language or elephant trees that grows downwards. After an hour, our ferry began moving through the famous Mangrove forest. I was quite surprised to see so many trees growing in the mushy water. It was an experience of a lifetime! The ferry went through a very narrow waterways with thick vegetation on either side which are inhabited by forest monkeys and snakes. We stopped at a floating restaurant to witness fish show. After stopping here for about half an hour, we again started traversing the mangrove forest again. Our ferry driver was sporty enough to show us some stunts on the ferry after which we broke for lunch in another floating restaurant. The lunch consisted of fried rice, baked chicken, salad and some freshly cut fruits. The price was included in the ticket. As the ferry subsequently progressed through the Mangrove forest, we got a glimpse of the emerald green water of the Andaman Sea. The mushy water and jungle gave way to the green water of the Andaman Sea and limestone cliffs. At long last, we reached the penultimate place of the day’s adventure – the KILIM GEOPARK. As we sailed through the emerald green waters, we were greeted by many rare species of birds flying over and around our ship. I was left speechless at this view and wondered how nature could be a beautiful, fairyland. about to visit or is in Langkawi in order to truly understand why it is called the “Jewel of Kedah”. The mesmerizing views from the day kept flashing in front of my eyes while we were being transported back to our hotel. We freshened up quickly once we reached the hotel and headed out to the famous Cable Car Tour in Langkawi. It was more of a touristy affair but my better half wanted to do it. We reached the site by Uber and to my pleasant surprise, the Uber driver was an ardent Shahrukh Khan fan. He played different hits of SRK and kept talking about the legend at length with us. We paid him 24 RM once the trip ended and booked express tickets for the cable tour costing us 50 RM each. The cable car in Malaysia is the world’s highest cable car. 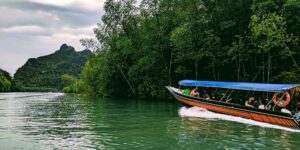 We had a 360 degree view of pristine beaches, waterfalls and lush green jungles from the cable car and also recommend this activity while in Langkawi. The cable car tour was followed by a visit to the 3D Museum where we clicked many pictures.many pictures. Once these were done, we strolled through the Pentai Cenang roads. This is the place where all the hustle and bustle activity of the city goes on. We had a light dinner and came back to the hotel at around midnight. Our next day plan was to fly for the Perhentian Island from Langkawi to KL and then by connecting flight from KL to Kota Bharu. We got up at six in the morning. By the time we were done with our packing, the taxi we had booked arrived. The taxi charge was 25 RM. I bought a bottle of Jameson (duty free) for 128 RM, got done with our security check and got going on our way to the capital city – KL. From KL, our connecting flight to Kota Bharu was at 11 AM and reached Kota Bharu by 2 PM. Our resort officials from Perhentian had arranged for our transport from Kota Bharu. It was a 45 minute drive from Kota Bharu to Kuala Besut Jetty and from there to Perhentian Kecil, it was another 45 minute ferry ride. One thing to remember here is – ferries from Kuala Besut are not available after 4:30 PM. So it is advisable to do the booking accordingly. Alternatively one can stay the night at Kuala Besut and take the ferry in the morning. 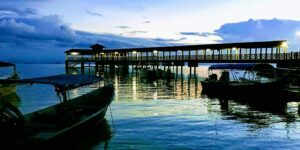 The significance of Kuala Besut is that it serves as a gateway to the beautiful Perhentian Island. We were charged 280 RM for return transfer to Kota Bharu airport. Crystal clear blue waters, coral reefs replete with exquisite fish, white beaches, coconut trees leaning towards the sea, a perfect threshold to paradise. That is how the Perhentian Islands are. After a bumpy boat ride, we approached the beautiful Perhentian Kecil Island. My eyes lit up at the sight of the crystal blue waters and the beautiful white powdery shoreline. I told myself, “We are in for a perfect beach holiday”. We checked in to the Shari-La beach resort which is situated in the Coral Bay and presents a gorgeous view of the clear blue sea water. Perhentian Island is situated in the east coast of mainland Malaysia and is constituted by two islands – Perhentian Kecil (Small island) & Perhentian Besut (Big island). Perhentian Kecil which is the smaller island is recommended for budget travellers, whereas the big island is mostly high-end resorts and not as suited for backpackers. 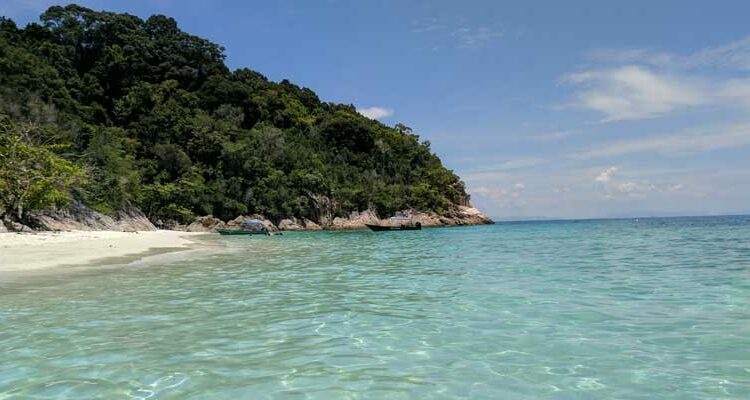 Perhentian Islands are undoubtedly amongst the best beaches for snorkelling, scuba diving and similar water adventures. We were almost at the last leg of our Malaysian vacation and there was no better place other than the incredible Perhentians to wind up. It is a perfect place to chill out on a hammock with a book, lying down on the beach while witnessing the clear beautiful waters and mesmerising beauty of Mother Nature. There are numerous small islands in the vicinity. Taking a stroll through these islands is highly recommended. When you are taken over by hunger, hop onto one of the many beach restaurants and pick from the variety of local food, don’t forget to try Roti-Canai, it’s a local delicacy and the amazing barbeque sea-food. We went for island hopping in the morning on a boat, stopping at many viewpoints. 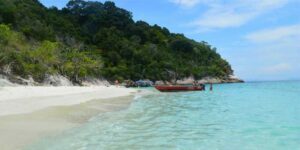 Perhentian has many beautiful beaches like Lagoon Beach, Adam & Eve Beach; I fell in love with the white powdery sand of the romantic beach and the absolutely beautiful sunset from the Coral Bay. Among the numerous activities, one has to indulge in snorkelling here. The marine life is surreal in the Perhentians. We swam with turtles, reef sharks, blue-spotted rays, humphead parrotfish. We also witnessed a monitor lizard and were thrilled to see one in real life. To sum up the experience there – it was quite the paradise. In the evening, we ventured out to the Long Beach to witness some intriguing fire shows. This is one of the best places to party and chill out at night. To reach here from Shari-La resort, its a 20 minute walk through the jungle which I believe is safe. However, do not forget to bring some torch lights as there are no lights on the way. Long Beach is the most happening place in the Perhentians. It’s where you can meet and mingle with people from different cultures and make friends. As all beautiful things come to an end, so did our sojourn of the Perhentian Islands. With memories to cherish for a lifetime and some good friends made, we moved to our last stay of our Malaysian vacation – Kuala Lumpur. In Kuala Lumpur, we checked into the Federal Hotel in Bukit Bintang. It’s a four star hotel and oh boy….did we choose the right hotel. Awesome and picture-perfect to indulge in some luxury, everything is in close vicinity including multi cuisine eating joints, China Town/ Petaling Street, Hawker Food Row/ Jalan Alor. The following day we decided to tour the city with the goal of exploring various famous places in KL. Though this is a touristy affair, however these places do not deserve a miss. ✓ Don’t miss visiting the Petronas Towers/ KLCC fountain show at night, Chinatown, Central Market and at least one of the rooftop bars. ✓ Merdeka Square – literally meaning Independence Square is the usual venue for the annual Merdeka Parade (National Day Parade). A 95-metre flagpole, one of the tallest in the world, is located at the southern end of the square. ✓ Istana Negara – used to be the palace of the former kings of Malaysia before a new palace was erected in 2011 and Istana Negara was designated as a royal museum. HOW TO REACH MALAYSIA: There are frequent flights from India to Kuala Lumpur. Air Asia, Jet Airways, Air India, Thai Airways, Qatar Airways, Malaysian Airline, Singapore Airline fly to Kuala Lumpur from India. VISA: Malaysia only offers Visas on Arrival to a very few nationalities and then under very specific conditions. Indian travellers requires to apply online visa to stay in Malaysia.